I love eating anything pickled but nothing can beat Vietnamese Do Chua (pickled vegetagbles). Some people add Sriracha to everything, well that's how I feel about Do Chua. 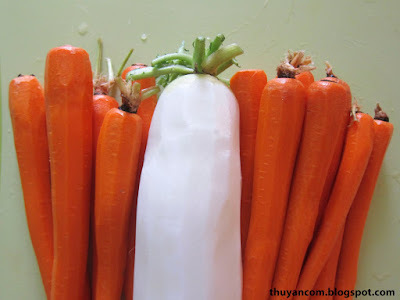 Anything that requires prepared nuoc mam, I will add Do Chua. It add some sweet, sour, and crunchiness to dishes such as Banh Beo, Banh Xeo, Banh Mi, Ca Nuong, Com Tam, Thit Kho, and many more. I always have some handy in the fridge because you will be surprise what you can eat with it. 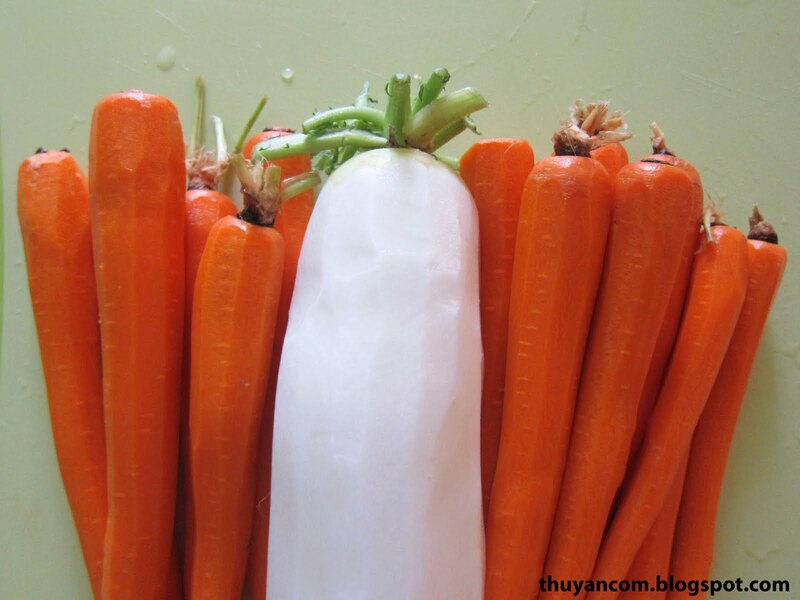 There's a variety of vegetables you can pickle; cucumbers, onions, peppers, but the most common in Vietnamese cuisine are carrots and daikons. The pair are often found in Vietnamese Banh Mi, and it does make a huge difference. I always have to make sure they did not forget my Do Chua, or else I will be a very unhappy camper. Do Chua comes in a variety of sizes and shapes, and that is completely up to you. I prefer it a little smaller than what you would find in a Banh Mi but not as fine as being julienned, one of the best thing about Do Chua is the crunch and you just can't get that when it's too fine. Be prepare to do a lot of peeling but I guarantee it's worth all the effort! 1. Prepare the daikons and carrots to your liking. 2. Warm the water in pot, it does not have to come to a boil. Add the vinegar, sugar, and salt to the water and stir. 3. 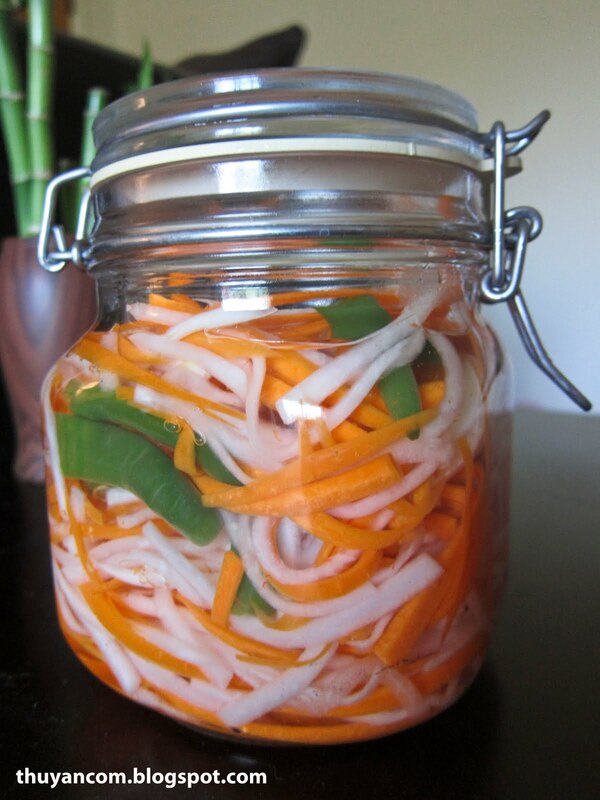 Add the daikons, carrots, and chili to a jar. 4. Add the warm mixture from step #2 to the jar. If you would like to eat it within a couple of hours, it will pickle faster at room temperature. If you are in no hurry just stick it in the fridge. Enjoy! I love this especially on a vietnamese sandwich, or either with vietnamese egg roll and rice noodles mixed together. My wife makes this, but I will show her your recipe and hope she will try it also.